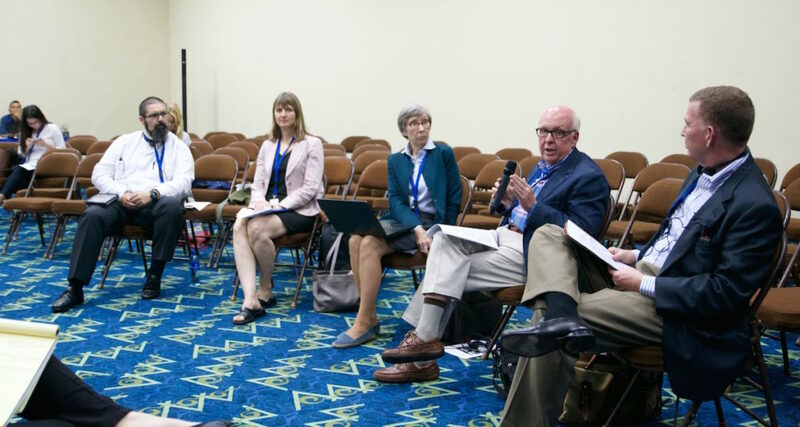 With ongoing crackdowns on freedom of expression around the world, free speech advocates met to discuss the connection between corruption and human rights at the 17th International Anti-Corruption Conference in Panama City, Panama. First to speak at the morning panel, Miranda Brown spoke about her experience as a whistleblower at the Office of the High Commissioner of Human Rights, the UN agency responsible for monitoring human rights abuse cases. She played an important role in revealing the allegations of child sexual abuse against French peacekeepers in the Central African Republic. She said UN OHCHR lacks clear guidelines about how to report such cases to superiors. Moderator Alison Glick raised the point that UN peacekeepers are the largest deployed military force in the world, which operated on a budget of $7.86 billion in 2016. She asked Ms Brown how the UN could reform its whistleblowing policy. Claudio Nash from the Faculty of Law at the University of Chile shared how corruption and human rights abuses impacted Chile’s transition from dictatorship to democracy. According to the country’s Commission of Truth and Reconciliation, more than 35,000 people were victims of human rights abuses under Augusto Pinochet from 1973 to 1990. “In Chile, people say that the dictatorship violated human rights, but at least the government didn’t steal,” he explained, speaking about what he called the “normalization” of human rights abuses under the regime. Civil society activist Bruce Moore discussed how the drafting of anti-corruption legislation, saying “anti-corruption systems have been captured by elites,” including in advanced democracies such as his native Canada. He added that despite the criticism, the UN has still managed to “move forward a human rights-based approach to development”, but that the agency needed “to empower people on a local level to create sustainable change”. Keith Henderson, a Professor at the Washington College of Law and Fellow at the Government Accountability Project, focused on the World Bank’s whistleblower protection program. He presented his research on the topic, saying the organization’s policy needed to be more transparent. Henderson wrapped up the session with a call of action to create a basic bill of whistleblowers’ rights to ensure their protection under international law, which first and foremost, protects their anonymity. “Whistleblowers need to be able to report corruption anonymously,” he said. Kait Bolongaro is an award-winning Canadian journalist based in France. Her work has been published by Al-Jazeera, the BBC, Vice, Christian Science Monitor, and Deutsche Welle, among others. She has reported from Africa, Asia, Europe, North America and Latin America. Follow her on Twitter @kbolongaro.